Your first teddy bear. That favorite book. The cute outfit you had to have. It’s tough to part with things that bring up fond memories. Sometimes we hang on to childhood memorabilia because we think we are going to pass it on to our kids or grandkids. But let’s be honest: What you found essential, your kids may not care about. Stuff also deteriorates over time: elastic gives out, colors fade, and things get squashed. Sometimes older things may not be safe because of lead. And who knows what they’ll discover is unsafe in the future! It’s okay to save a few special mementos. 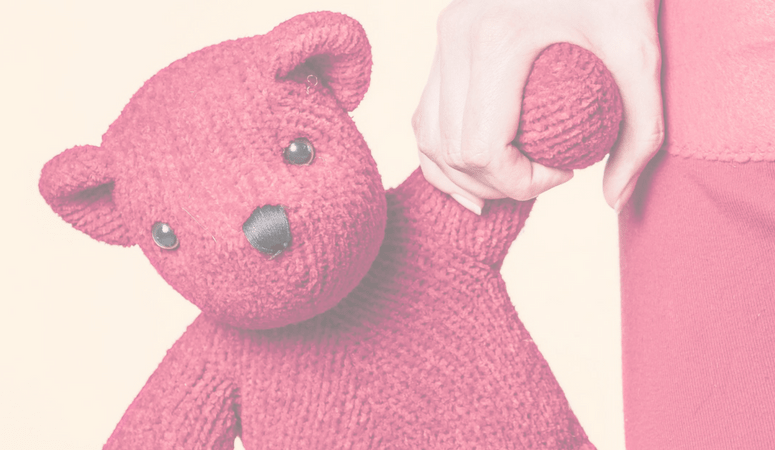 I saved my first teddy bear and one doll that I played with. Just be picky about how much you save. And if you do save it, make sure you have it where it can be enjoyed. Display it or put it in a special memory box that is NOT stuffed in a storage space. Don’t keep “saving” things for someday. Let your kids have it. The best thing I kept is an antique doll bed made for my great-grandmother in 1887. Five generations of girls in our family have played with it. Even though it is an antique and is special, I still let my children play with it because that’s what it’s for. Yes, it may break someday, but if no one plays with it, what’s the point? It might as well be in a museum. Of my own kids’ toys, I saved Duplo, a Fisher Price barn, and board books. All of these things are timeless toys. I pull them out occasionally when I have visitors with small kids. Notice that these are things that actually get used occasionally. They are NOT being saved for “someday.” They have been repurposed as “guest” toys. For a long time, I kept a pack-and-play and a bunch of toys because I thought I could use them for my grandkids someday. But I finally realized that they would be very out-of-date after 20 to 30 years. So, I gave them away to people who need them now. Try using freecycle if you want to give things away (or donate nice things to shelters or other charity organizations). If you don’t feel emotionally ready to let it go of special items, try this: sort through your sentimental items to see if there is anything that is in bad shape that you know you can toss. At the same time, you may come across a few more items that just don’t mean that much to you anymore. Put them in a donate box. The rest may need to wait for another day, but don’t put it off forever! Make plans to revisit the saved items at least once a year. More time and a different stage of life can change your mind about what you really want to keep. Have a friend help you go through stuff and tell her the stories. Sometimes sharing your memories can bring a sense of closure so you can pass things on to another child. Rather than keeping 100 stuffed animals, take some pictures, and just save a few of the best. If you are going to save something because it has value to you, please find a way to display it. Don’t just stuff it in a box. Nothing says “I treasure this” like putting it in a place of honor. So, what can you do with items you decide can go? My best advice is to donate it to others who can use it NOW. When I was young, our neighbor passed on some Barbie dolls to me when they outgrew them. Talk about excited! 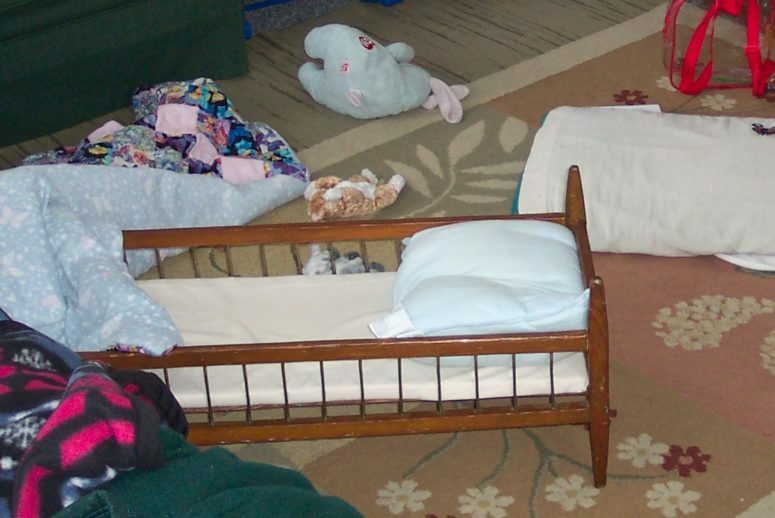 When my own daughter outgrew a dollhouse, we passed it on to friends who had 3 little girls. We pass on kids’ clothes regularly because I’m always getting more hand-me-downs. Books can go to libraries or daycare centers. Shelters may take toys. If you have something that is truly collectible, cash in now! Sell it and use the money for something that you need in your life now. Remember, your stuff does not define you. Pass things on that you no longer need in your life. Make room for a new chapter. Acknowledge that you once loved those things and they helped you create wonderful memories. Now let them go help someone else make memories. Thanks for the good advice. I especially liked sharing the story to help deal with closure. I think your post is the best one I’ve read in a long time. Sincere. Thoughtful. Kind. Helpful. Thank you. Thanks for taking the time to say so! Do you have any tips for buying things in stores that you will actually use instead of leaving it to gather dust in a closet or other space? It can be difficult to resist the impulse of buying something even though you know you’re not going to use it. My best advice is to stay out of stores! It is so easy to buy stuff you weren’t planning to buy. I try to only go into stores when I have a specific item I am looking for, or with a shopping list. If you do buy something that you quickly realize you are not going to use, return it. What about the China my dad gave my mother from Okinawa back in the 50s? Family treasures are the hardest sentimental item to deal with! A few thoughts: 1) Is this item currently being displayed or used in some way, or is it stored in a box in an attic? If it isn’t living a “useful life” in some way, consider the next two ideas. 2) Is there anyone in the extended family that would truly like to have the item? 3) If it is valuable, could it be donated to a museum or some historic organization? 4) If it is not wanted by anyone, perhaps you could save a cup and saucer to display and donate the rest to a thrift store. That is what my mother did with my grandmother’s China, and it is quite lovely. Really like the idea about the china. My mom is in her 90’s and has a set of beautiful china that has always only come out for holiday meals…which haven’t happened in at least a decade. I’m going to suggest the idea of a display cup and saucer and donating or selling the rest. Nice! I think it’s a great way to remember without the bother of storing the whole thing. This post has really gotten me off dead center. My emotions continue to hold me back from decluttering, but this really clears air for me and gives me a path to follow. Thank you. So glad to help! I hope you will be able to make some headway with all the sentimental stuff. Keep going! I admit it, I am a hoarder. I don’t get rid of anything, my mother was the same as was her mother. When I need to clean and get rid of things I ask for my sister or my niece to help. They are not attached as I am. It’s good that you have someone you can call on for help. You are right that it is much easier for other people who are not attached to get rid of things. I am new in decluttering, but I enjoy this going through stuff, evaluating, categorising, placing things in a practical way. I still live a messy life with my kids in tiny apartment, but key for me is to keep going as the day allows me. Think of taking lovely photos of your most valued memories, toys, clothes or jewellery, then store it in drive and they will stay with you even if you pass them on. Some things are just too precious to get rid of and will become heirlooms and will be going into a Treasure Chest, a wicker basket that I’ve got that will keep these things safe. Other sentimental items will be offered to my children, if they don’t want them, then I’ll take photos of them and either sell or donate. I’ll print the photos and write on the backs of them just what the item was, it’s significance and any story that goes with it. The way I see it, the item will live on in our hearts and minds through the photos in the treasure box but it will be of use to someone else.